You know of Counter-Strike: Global Offensive, and you likely know of its many weapon skins – some selling on the Steam marketplace for thousands of dollars. What might have passed you by is the humongous industry of skin betting, where sites let players bet on matches with their cosmetics. They’re assigned values, and winners get sent the skins of the losers, effectively making them a currency, even if it’s rather difficult to get out of the Steam economy and back into real-world dollars. This lawsuit alleges that Valve not only allows but supports that gambling and seeks unspecified damages. The Steam Summer Sale 2016 might be a better way to spend your money. 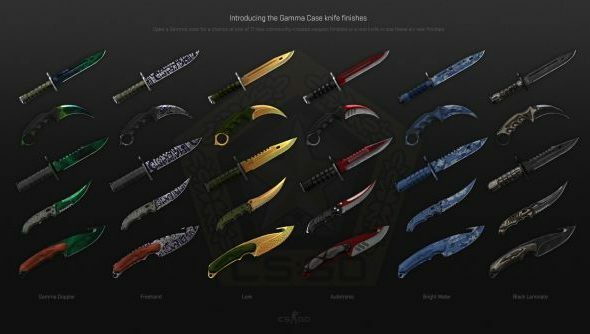 Skins themselves are acquired through crates like the recently added Gamma Cases or timed drops. The amount of luck required to receive the prettiest and rarest is what leads to their extreme value and, therefore, the basis of a gambling system. As reported by Polygon, the suit’s main point compares CS:GO betting to a casino and accuses Valve of using it as a revenue stream. Michael John McLeod, for whom the suit was filed, says that he gambled with his own skins and lost money, both as an adult and a minor. He also points to a report by Bloomberg that says that teen gamblers are a large part of the audience. You can read the full details of the suit here. Meanwhile, CS:GO had two of its best months ever in April and March of this year, according to aggregator SteamCharts. The official site also advises that 10 million unique players were in-game in the last month. Much of this growth came in the months following the Arms Race update of August 2013 that added the skins system to the game.